[to Derek] "It's just... I'm exhausted. My mother is exhausting. What happened to Cristina is exhausting. And you? Hating you is the most exhausting of all. And I don't want to do it anymore." MEREDITH [jogging with Cristina] "This is supposed to make us feel better." CRISTINA: "Do you feel better?" CRISTINA: "Sleeping with our bosses was a great idea!" CRISTINA: "Do you want to cry?" CRISTINA: "Do you want to cry now?" Permalink: Do you want to cry? Yeah. Do you want to cry now? No! IZZIE: "How can someone be so offensive, yet so charming all at the same time?" ALEX: "It's an art form." [to Meredith] "Look... I'm just saying you can talk to me if you want, because, you know, even if I repeat every word you say, no one around here likes me. They'd just call me a liar and move on." ADDISON: "Option one, I go home. End of story. Option two, I could apologize, you could forgive me, come home, but you could still bring it up to use against me whenever we argue." DEREK: "Are you trying to be funny?" ADDISON: "Satan has a sense of humor." DEREK: "Is there a third option?" ADDISON: "I don't know what the third option is. I just know I still love you." "What kind of person wishes her mother has cancer?" Permalink: What kind of person wishes her mother has cancer? DEREK: "Maybe you should've thought of all this before you gave chief to Burke and invited Satan to Seattle." ADDISON: "Good morning Richard, like the hat." 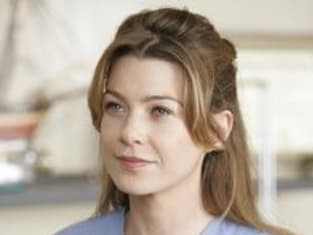 ADDISON: "Actually, I prefer to be called ruler of all that is evil. But I will answer to Satan." "You think... you think you know someone, know who they are. You share a house and make wishes on eyelashes with them and we don't know each other, none of us. We're just a bunch of interns who work together. There's nothing there!" MEREDITH: "It's not okay. You have a wife who's not easy to hate. Who's annoyingly kind and painfully smart, and currently saving my friend's life." "I've been sitting home for a week watching Oprah give away things on T.V. Oprah, Derek!" MIRANDA: "Go take care of Dr. Grey." GEORGE: [hugs her] "Yes. Thank you. She needs a friend right now." [narrating] "Surgeons are control freaks. With a scalpel in your hand, you feel unstoppable. There's no fear, there's no pain. You're 10 feet tall and bulletproof. And then you leave the O.R. All that perfection, that beautiful control, just falls to crap." [narrating] "Nobody likes to lose control, but as a surgeon there's nothing worse. It's a sign of weakness, of not being up to the task. Still there are times when it just gets away from you, when the world stops spinning, when you realize your shiny little scalpel isn't gonna save you. No matter how hard you fight it, you fall. It's scary as hell. Except there's an upside to the free fall. It's the chance you give your friends to catch you."